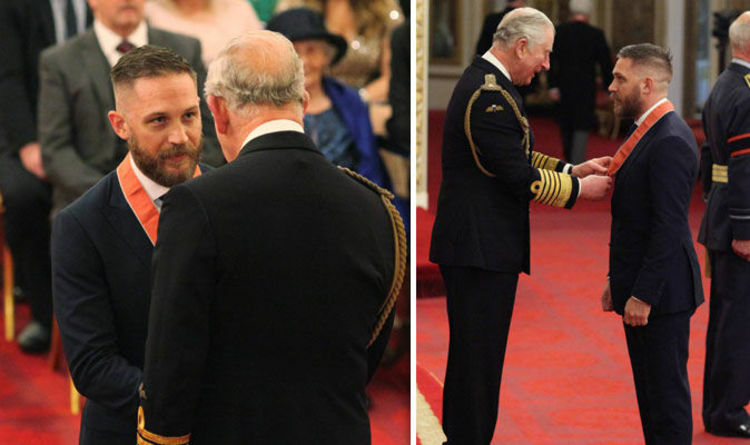 The film star, Tom Hardy, 41, was honoured by the Prince of Wales at the ceremony. The actor made his name on the big-screen with roles which include Mad Max, The Revenant, Inception and Bronson. However, the star has also made an unlikely appearance on CBeebies reading a bedtime story on the pre-school channel last year which was a hit with mothers. The Venom actor looked dapper in a navy blue suit and smart brogues where he rocked his signature statement beard. Tom appeared in good spirits as he chatted with Prince Charles. He became an ambassador for The Prince’s Trust in 2010 and has known Prince Harry for many years. The pair have remained close friends, with the actor was amongst the host of the celebrities who attended Harry’s nuptials to Meghan Markle. In an interview with Esquire magazine, Tom had described Harry as a “legend” and told the publication he had flown from filming in New Orleans to attend the Duke of Sussex’s big day. The Duke and Duchess of Sussex invited Tom, 40, and Charlotte, 36, to the wedding, and he appeared to be the talk of the star-studded guest list at the Windsor Castle. On the day, the actor opted for a smart navy suit with a matching tie, and sported a bald head which he did for his new role as Al Capone in his latest film Fonzo. His wife Charlotte colour co-ordinated with her husband in an ankle-length navy dress adorned in multiple flowers. Meanwhile, the actor was captured sweetly hugging a young fan at the premiere of his latest film. The British star greeted fans and stopped for pictures at the star-studded event and could be seen crouching down to talk to a young fan before their heart-warming embrace. The pair then posed alongside each other as the photographers snapped away at the two of them. He accessorised his look with a pinstripe waistcoat and his wrists showed off his slew of beads. His attention soon turned to a dog who made his debut onto the red carpet. The father of two looked absolutely besotted with the gorgeous pooch as the actor bent down to play with the golden wonder. The Venom frontman is not discounting having a sequel to the film. Speaking to Totalfilm, Tom said: “I’m open to whatever you want to do with it.